Will the Supreme Court restrict rights to the procedure? Nearly a half-century after the U.S. Supreme Court declared a constitutional right to abortion in Roe v. Wade, the landmark ruling is under sustained attack by anti-abortion forces hoping the current court's conservative majority will impose new limits on the procedure or overturn Roe altogether. 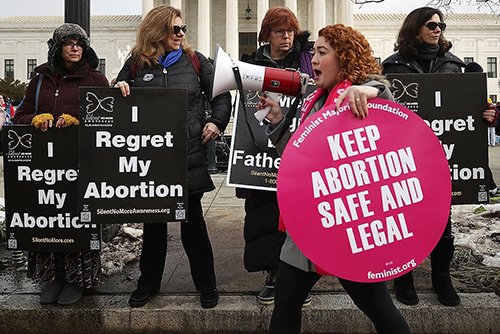 More than a dozen cases championed by anti-abortion activists and conservative state legislatures are making their way through lower or appellate courts, and any of the cases could provide a pathway for the Supreme Court to alter federal abortion law. In response, abortion-rights groups and liberal legislatures are pushing to expand abortion rights under state law to preserve access to the procedure in the event of a federal pullback. Among the legal issues at stake in the fight over abortion are whether states can ban abortions based on a fetus' gender, race or disability, at what stage of pregnancy a fetus is able to feel pain and at what stage a fetus can survive outside the womb.